During my growing up years, I was always tasked by my late mum to pound dried chillies, shallots,garlic and candlenut whenever she cooks curry. I detested this task so much so that after my job is done, I would not be bothered to stay in the kitchen to watch her cook her delicious curry. It was also not very often the family had chicken curry which was considered as occasion food in my younger days. So I have never learnt to cook nice chicken curry, and there is no family recipe to follow. It is also out of sheer laziness and convenience that I have always cooked chicken curry with store bought rempah. Today, I'm a little hardworking(I think peeling shallots is hard work ). I cook a pot of Kari Ayam from scratch. I am a happy cook, the Kari Ayam from scratch is so sedap! I don't think I will buy another store bought rempah again, even on my lazy cook days. Mix all the ingredients A thoroughly, rub each piece of chicken thoroughly with the powders and salt and marinate for at least 1 hour, preferably overnight in the fridge. To a heated wok, add oil followed by blended onion-garlic-ginger paste. Stir fry slowly under medium heat until aromatic, 3-5 minutes. Add marinated chicken chunks. Stir fry until the chicken are well coated with the fried ingredients. Continue to stir fry under medium heat for another 10 minutes. Add water as well as half the amount of coconut milk and potatoes. Bring the mixture to a boil before simmering with lid on for 20 min. The chicken cube should be added now if using. Add remaining thick coconut milk and return to a boil before simmering to medium-low heat for the last 10-15 min or until the chicken and potatoes are soft and thoroughly cooked through. A sprig of curry leaves is added at this point to 'refresh' the aroma of the dish. Note: I blended the rempah ingredients together with the curry and chili powder. I shallow fry the potatoes before adding into the chicken. All photos taken from my Iphone camera. Wishing all my readers here a Blessed New Year! Proverbs 23:18 tells us about God's promises and to face the new year with hope. I was away on holiday in the UK and want to share with you this beautiful light and sound show at Shakespeare's birthplace in Stratford upon Avon. My dear Lian, your Kari Ayam looks so sedap la....You are a genius when it comes to cooking. Wish I am your neighbour. Thanks for the recipes and the wonderful pictures. Your pot of chicken curry looks yummy-licious! 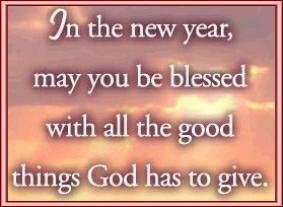 Blessed New Year to you & family!